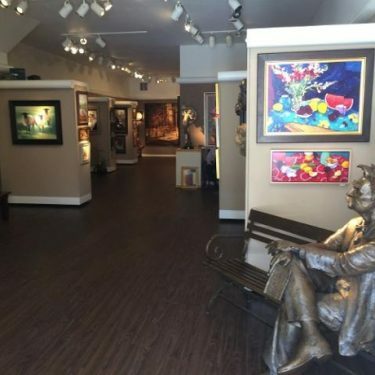 CARMEL, Calif. —New Masters Gallery is back open in Carmel, more than a year after a destructive fire shut down the art gallery. In June 2015, a fire started in the back room of New Masters Gallery and while firefighters were able to put it out and save the building, significant damage was done. “You know, I’ve had the gallery, I started it 43 years ago, and this fire has been the worst event in all 43 years,” said owner Bill Hill. Firefighters and bystanders rushed in during the fire to save paintings, but holes were left in the floor and there was a lot of smoke damage to the space and the artwork. “The gallery was destroyed and we were not able to use the gallery for a year and a month because it was all being rebuilt so it was tough,” Hill said. Hill had new floors put in and is still in the process of getting all 1,900 paintings that he had at the gallery restored. All of the artists stayed with the gallery and Hill was able to add some new ones to the list. Friday evening, the Carmel Chamber of Commerce is scheduled to do a ribbon-cutting for the grand reopening, and a party will follow and continue on Saturday. The cause of the June 2015 fire is still unknown.